Oxford Film Festival Take 5 With...: Chasing Gus’ Ghost documentary screening in Oxford, Miss. Chasing Gus’ Ghost documentary screening in Oxford, Miss. CHASING GUS' GHOST, a film reflecting the life of Clarksdale, Miss. native, Gus Cannon and the influences of jug music will be showing at The Powerhouse in Oxford, Miss. on Tuesday, Apr. 14 at 7 pm. Gus Cannon of Clarksdale, Miss. is recognized as one of the most renowned jug band musicians. Cannon moved to Memphis, Tenn. and began his career that span from playing the juke joints of Beale Street during the 1920’s to recording for Stax in the 1960’s. The strength of jug music was found in his hit song “Walk Right In” which has been covered by several famous artists from the The Rooftop Singers to Janis Joplin and was even included in the movie Forrest Gump. 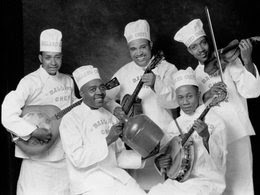 Filmmaker Todd K. Wait has made a movie tracing the roots of jug band music and how it evolved into folk and rock music. The film include interviews and live performances by John Sebastian from the Lovin’ Spoonful, Maria Muldaur, Bob Weir from the Grateful Dead, and Charlie Musselwhite. A free screening is being presented by Living Blues Magazine, The Oxford Film Festival and Yoknapatawpha Arts Council at The Powerhouse on Tuesday, Apr. 14 2009 at 7 p.m.
For more information on the Oxford Film Festival, call (877) 560-FILM or email Melanie Addington at melanie [at] oxfordfilmfest.com.